If you’re searching for ways to save money in your home, consider taking a hard look at your appliances and how you use them—home appliances like dishwashers, refrigerators, and laundry machines account for about 13% of a household’s energy costs. ENERGY STAR-qualified clothes washers and refrigerators are about 20% more energy efficient than typical models, and ENERGY STAR-qualified dishwashers only use about 5.8 gallons of water per cycle or less—older dishwashers purchased before 1994 use more than 10 gallons of water. You can also take smaller steps like only running your dishwasher with a full load, scraping food off of your dishes, and letting your dishes air dry. All of these can help cut the energy use of your dishwasher. You can also consider using cold water when possible and drying towels and heavier cottons in a separate load or air drying when doing laundry. The average U.S. household spends $5,550/year on energy. But buying energy-efficient appliances, making energy-efficient home improvements, and taking energy-efficient actions every day can save hundreds of dollars. 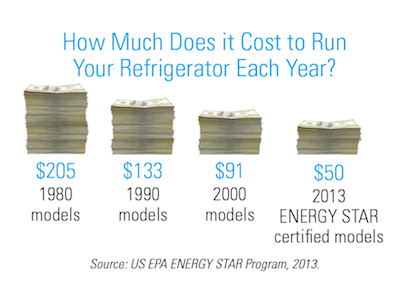 Buying ENERGY STAR appliances can save up to 30% on electricity bills. Bonus tip: replace incandescent light bulbs with energy-efficient halogens, CFLs or LEDs and save 30-80% on energy bills. 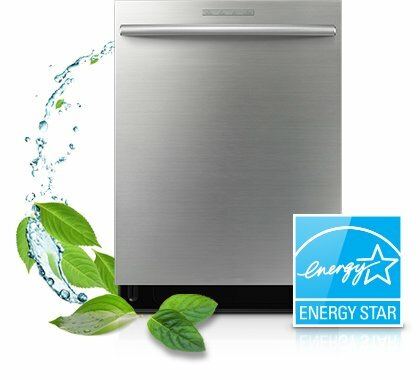 Many features in an ENERGY STAR qualified dishwasher result in better cleaning. ENERGY STAR qualified dishwashers boost water temperatures to 140 degrees, which allows for improved disinfection compared to hand washing. A new ENERGY STAR qualified dishwasher uses less than half as much energy as washing dishes by hand and saves nearly 5,000 gallons of water a year. Because they use less energy, ENERGY STAR qualified products reduce air pollution and greenhouse gases caused by burning fossil fuels. By reducing water consumption, they also help protect our lakes, streams and oceans. The color blue offers a stunning versatility that makes it an ideal complement when paired with different colors, textures and styles. Universally some shade of the color blue is a favorite among men & woman. This versatile color has the ability to be friendly, demanding, powerful, peaceful and even trustworthy. 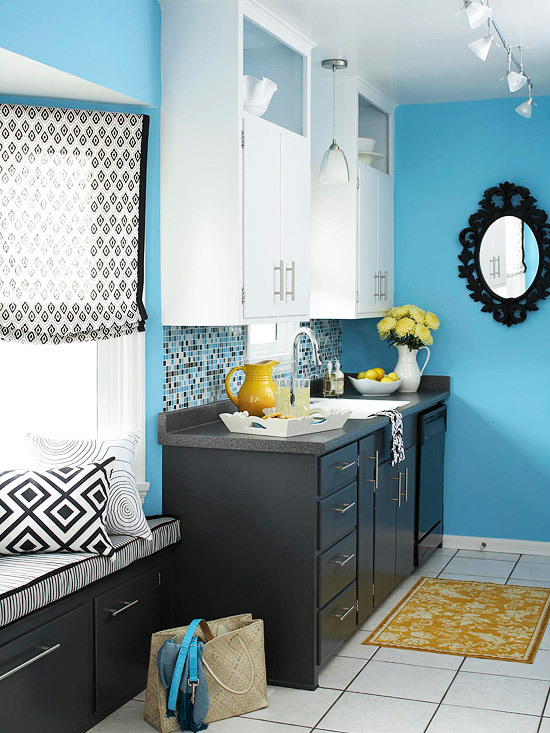 Check out these images below to see how homeowners incorporated it’s many different shades into their kitchen & baths. 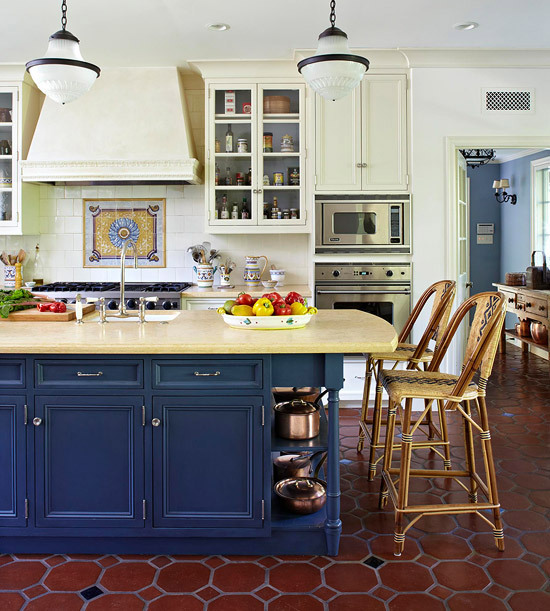 Blue, yellow, and red define this formal kitchen giving it a rustic but fun look. One of my personal favorites, southwestern with a touch of rustic charm. 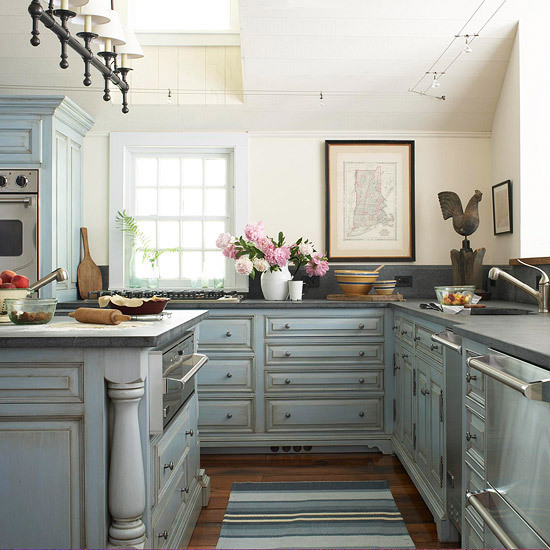 French blue-painted cabinets paired with stainless steel appliances give this kitchen a traditional but modern feel. Coming together for something that is extremely charming and beautiful. 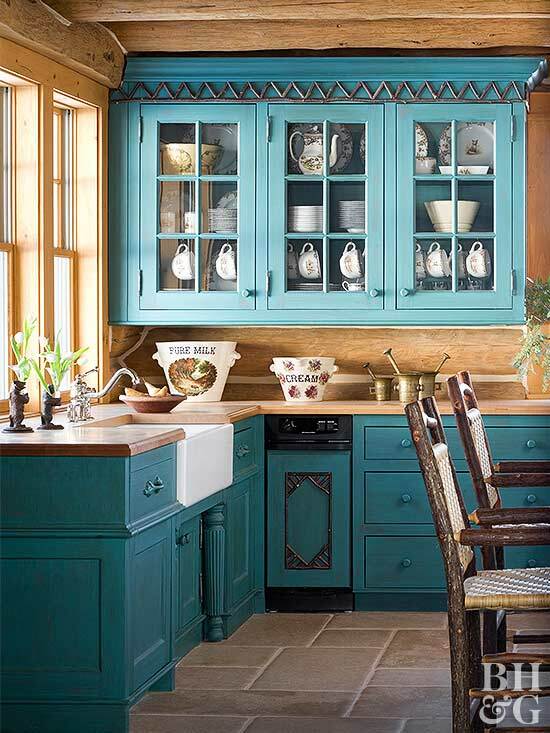 Azure blue walls provide a stunning backdrop for this neutral cabinetry in shades of white and charcoal gray. How gorgeous is this Cobalt Blue Mosaic tile?! 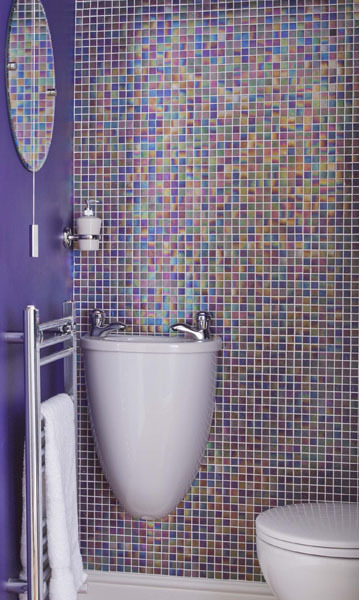 The indigo wall pairs beautifully with this iridescent tile. 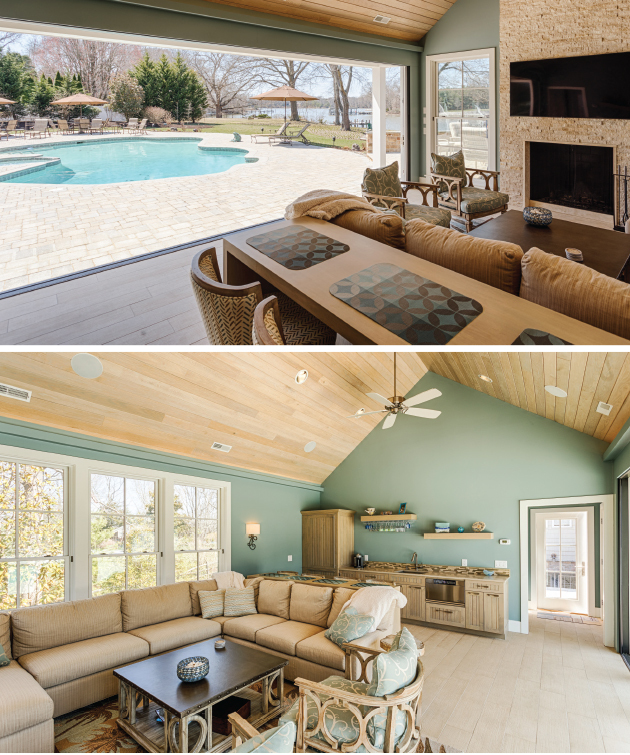 Aqua paired with natural oak gave this custom built pool house (Lundbergbuilders.com) a beachy vibe.